This article is by Frank Jossi and was originally published in Finance & Commere here. Located on the sprawling, football-field-size rooftop of the Court International Building, St. Paul’s largest solar photovoltaic array is an example of an emerging clean-energy financing trend. The 430-kilowatt Court International array is one of four solar installations along University Avenue in St. Paul owned by Washington, D.C.-based WGL Energy Systems Inc. 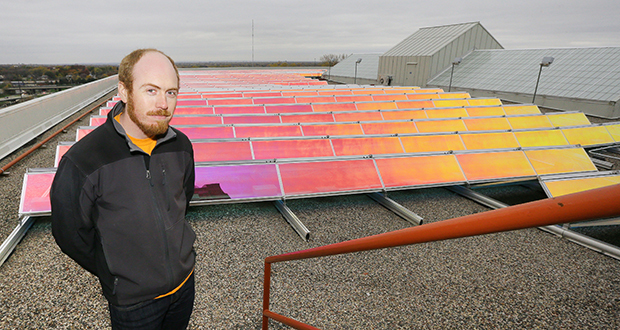 The arrangement is part of a third-party ownership model in solar energy that is common on the coasts and has begun to have an impact in Minnesota. The project was the brainchild of Roseville-based IPS Solar, which found building owners and managers along University open to having their solar installations owned by an outstate company. Indeed, it is becoming another option for financing clean-energy projects. “I would say third-party ownership is growing because competitively priced solar systems with more creative financing approaches are now hitting the marketplace,” said Minneapolis-based Green Financing Solutions founder Ian Schonwald. As it turns out, it’s also a pilot project, in a sense, for third-party ownership on commercial buildings in the Twin Cities. Under the terms of the arrangement, representatives of the four buildings involved in the program signed 15-year contracts with WGL Energy that include “power-purchase agreements” that set predictable energy prices into the future. Third-party ownership is one of the growing number of ways building owners can support solar energy and reduce their utility bills. One common approach is for businesses to own their own systems and take advantages of the tax breaks. This remains the preferred route for businesses that want to gain the greatest savings, said Pasi. CERTs, a statewide nonprofit promoting clean energy, recently worked with Woodbury on a plan to attract a third-party developer for a project to be placed on the grounds of a local sports facility. Bids are due in November. What emerged is a model request for proposals that other cities can use, Lindstrom said. In the case of the four municipalities, the contract options being tendered by two financing companies will be better than anything offered by community solar providers, said Schonwald. For both Brooklyn Park and the multi-city collaboration, the savings from solar could cut 15 to 30 percent from their electricity bills, he said. Farmington may have the largest solar project of any school district in Minnesota, well over three megawatts. The owner is Florida-based Kenyon Energy; the installer is Sundial Solar. Dan Miller, director of operations for the Farmington Area Schools, said the installation mixes rooftop with ground-mounted solar.